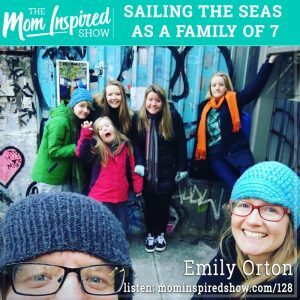 Today we have Emily Orton on the show and we talk about her fun adventure at sea with her family of 7! Emily shares with us how sailing lessons turned into a decision where a dream would become a reality to sail the seas as a family. She tells us that their goal was to help their kids learn how to live their goals, and how to customize their life and not just do things because of what other people think. Some of the lessons their kids learned during this amazing adventure at sea was they learned to be comfortable being uncomfortable as well as becoming more their self in a deeper and faster way. One story that really stood out to me is when Emily shared with us that it could be really hard not having space to yourself on the sailboat where normally you don’t get to experience having too much time with each other in the modern world. Hear what she says about this topic and more on the podcast. Looking to making your own memories with your family traveling? Let me come alongside of you and help you plan your next family vacation, best part is its FREE to you! If you are looking to travel somewhere this summer or next year I can help you. Feel free to respond to this email and let me know that you are wanting to start planning your next vacation.